This was an awesome night at the Bluebird. I played in the round with Jackson Wells, Paul Jefferson and Trey Bruce. All of these guys are amazing!! Marty Brown, who is currently recording a new album with legendary producer, Keith Stegall, popped in to sing a song I co-wrote with Tom Douglas that he just cut (recorded) called "King of Music Row." Tom (not pictured) came in to play piano on the song, too (and played his monster hit, "The House That Built Me"). The best part was that my sister and her friends were there that night (they flew in from California). Definitely a highlight! Since living in Nashville, I have gotten to hear tons of amazing singers and songwriters. One of my all-time favorites is Carole King. She doesn’t live in Nashville, but when she came to the Bluebird Café to play with some of her favorite songwriters, I was lucky enough to be there. I said hi but couldn’t think of anything else good to say. I was like a nervous teenager. 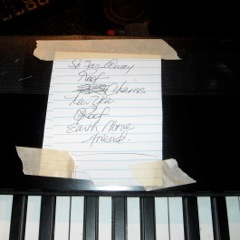 I did take a picture of her set-list (see above). “Friend” or “You’ve Got a Friend” is one of my all-time favorite songs ever. I think most people know James Taylor’s version, but Carole wrote it. It’s such a great song. I think what I like about her writing is you feel what she feels. She hurts, you hurt. She loves, you love. Her melodies are incredible, too. I think songwriters who play keyboard/piano write some of the most beautiful melodies. If you haven’t had a chance to listen to Carole King’s “Tapestry” album, you should definitely check it out! Let me know who your musical favorites are!